Karen Webber directs Les Miserables in the fast moving structure it is intended to have. Even with the fast pace it doesn’t lose the tender moments focused on personal struggle. Coupled with Michael Matthew Ferrell’s choreography the big scenes are a spectacle and play to the pageantry of them. Dieter Bierbrauer’s Jean Valjean is amazing. He plays the role to the heart embodying Valjean’s struggles and desires to become a new honest man. William Gilness’ Javert is commanding. His inability to accept Valjean’s change and accept his forgiveness is deeply moving. Sally Ann Wright and Carl Schoenborn’s Thenardiers are hilarious as the comic villains. They especially shine on “Master of the House”. The blocking and acting choices in this scene are perfect, especially Natalie Tran as Young Eponine at the performance I attended. Celia Salita portrayed Young Cosette at the performance I attended and her voice is beyond her years on “Castle on a Cloud”. Aly Westberg as Eponine stands out for her rich voice and ability to play to the tragedy of Eponine’s unrequited love for Marius. Laurel Armstrong’s brief appearance as Fantine is a delight. Musical Director Anita Ruth and the 24-member orchestra enhance the show’s power through their music. The show is non-stop music and its easy for a musician to become strained, but there is never an indication of that. The unit set with revolving center was designed by Michael Hoover. It is perfect for this show. The scene transitions are flawless and ups the production value of an already amazing production. 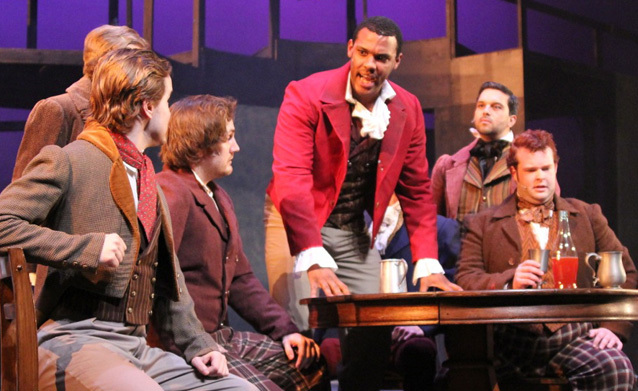 Whether you are a fan of Les Miserables or not, BCT’s production is one you should see. This production is the perfect example of a local theatre producing Broadway quality shows. Les Miserables runs through November 16 in the Schneider Theater. For more information or to purchase tickets visit Bloomington Civic Theatre’s website.